Is the sonic speed of social media forcing you to realize that you really need to collaborate with your ministry teams better? Google Wave is the latest iteration of social collaboration platforms that have hit the streets recently. 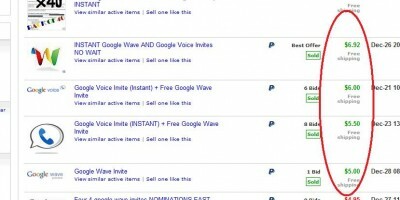 You’ve probably heard Google Wave’s awesome features. 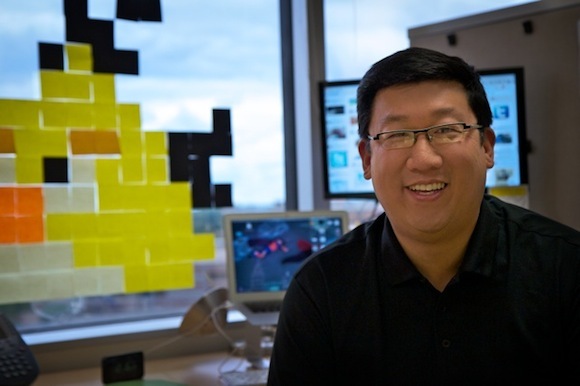 The big picture is that Google Wave hopes to replace email as the main form of communication between people and groups. But in the short term, until everyone adopts the real-time collaboration communication platform, it’s still useful for teams of people working together. For example, you can edit documents together with a group in real-time. No more waiting for others to edit and forward so that you can make your own edits. Everyone can see your changes live just as you type them into the computer. There’s other neat features too of course. In fact, there’s so much you can do with Google Wave, that the team at Google Wave originally created a 1-hour+ video overview of the new social communications tool! Of course that’s not the only way to get a new Google Wave account. If you know someone with a Google Wave account, you can get one of the invites that are periodically released to current account holders. I’ve got a couple of free invites to give out, so if you’re interested in trying out Google Wave with your ministry team, let me know — with your email address and I’ll send an invite to you as long as I have them available (right now, I have about 2 dozen free Google Wave invites). You may want to use the contact tab to send me a direct message vs. leaving a comment below with your email address in plain view for spammers to harvest, etc. The only requirement I ask for in addition to getting me your email address via the CONTACT tab (on the left side of the site), that you do leave a comment letting me know the name of your church/ministry and website address. It’s always good to hear from the readers of Godvertiser.com and see the links to your own site. Already have a Google Wave account? Send me a wave, and I’ll wave right back! The Brady Bunch was a classic TV show. Whether your favorite was Greg, Marcia or even Alice there’s something that all ministry leaders can learn from the Brady Bunch show. And all you have to do is watch the first couple of minutes of the show literally. The opening sequence with the 9 talking heads on one screen is the key. These days, there’s a new generation that’s reaching out across the web to meet online in multi-user video chat to collaborate in real time: meet the Tokbox Bunch. 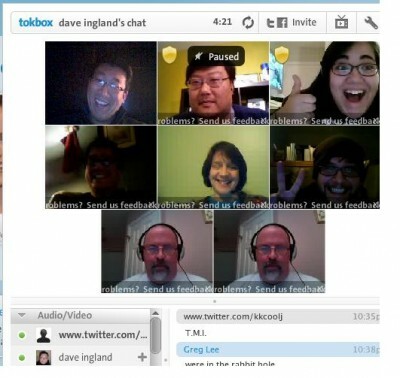 www.Tokbox.com allows anyone to jump into a video conference chat with NO software downloads or installations. It works across all platforms so all those Mac and PC people can actually make friends. What you get is a screen of webcam headshots – and you can control each one. Enlarge any one if you’d like to see them better. Mute or hide any participant. You can even shuffle around the order/placement of the boxes on your screen. Text chat is right there in the same window as well. The best part is that it’s free and it works. Dave Ingland, a church planter from the left coast recently tweeted a meet-up in a Tokbox room and instantly half a dozen of us joined the conversation. We ended up discussing some of the recent developments with online worship communities such as Andy Stanley’s church and how they are embracing online small group Bible studies. We heard some other online church’s experiences for using video conferencing in their own ministries as well. You always learn something when talking with other peers and leaders in your own field. That’s the point. The conversations are real. The video allows you to have full expression. It’s live and real-time. One real big upside is that you can easily tweet, call, text, or grab someone and tell them to get in the room by simply visiting the tokbox link. DONE. www.Tinychat.com is another multi-user video chat service that has taken off as well. Both harness technology for what it’s good for – removing friction of offline problems (physical distance) in an elegant way. BONUS TIP: And note that the service is perfect for group meetings, but works just as well if you have only 2 people involved. So think of it as Skype without the software or account hassles. You can suddenly make long distance video calls internationally for free. Have you tried Tinychat.com or Tokbox.com video conferences? What’s your experience? You’re either in or out. Excited or confused. Optimistic or a party-pooper. People always ask me why I use Twitter. Without getting into the usual “no, it’s not about broadcasting the flavor of my toothpaste, or any other mundane details of my daily living” conversation, here’s one concrete example that hopefully helps give a better picture for the power of Twitter. While I know that we’re not to make idols of men (or pastors of really big and successful books for that matter), but to illustrate the point, I’m sharing with you that I recently received a Tweet from none other than . . .
Yup, it was Pastor Rick Warren himself tweeting me about one of my latest web projects (more on that in other post soon, I promise!). Twitter, and social media in general, has collapsed the 6 degrees of separation into 1. You are now able to connect and collaborate with almost anyone else imaginable that’s relevant. It’s not that I tweeted back and forth with this person in particular. It’s the fact that just a couple of years ago, being able to connect, exchange, collaborate with someone like Rick Warren directly would take a lot of energy. Even if he tried to be as accessible as can be to people outside of his network (i.e. people he’s never met before), getting to him when I’m on the east coast, and he’s on the left coast (or somewhere else in the world) just isn’t that practical or easily done. 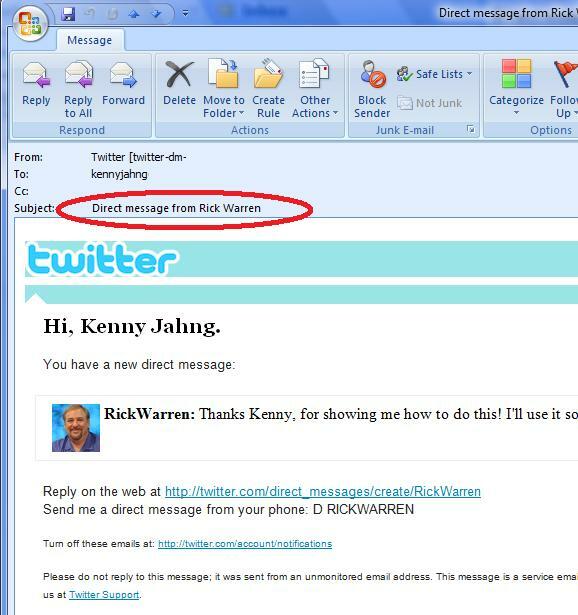 I’ve emailed his “rick@purposedrivenlife.com” email address listed in his books and website before. I’ve been to Saddleback worship services several times before. I’ve called the PDL team when our church launched our own 40 Days campaign before. I’ve gotten what I’vee needed from his ministry organization each time, but getting a chance to interact with Rick Warren directly himself wasn’t really feasible. Today, with social media, things have completely changed: The friction of access and connection is infinitely reduced because of social media. If you are proactive, purposeful and pleasant (don’t discount that last one! ), the possibilities are plentiful. It’s not just Rick Warren. Whether it’s Leonard Sweet or David Pogue of the NY Times, or even YOU that I’ve tweeted with . . . the fact of the matter is that 6 degrees of separation has become 1. That’s why I use twitter. What about you?